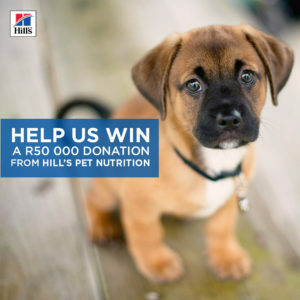 Hill’s Pet Nutrition has launched an exciting competition – www.HillsTransformingLives.co.za – in which you can win amazing prizes and also help us and other animal charities and shelters. Simply go to the www.HillsTransformingLives.co.za website and share your own story about how Hill’s food has transformed your pet’s life. If you don’t have a story to share (or don’t have a pet) you can simply like or share some of the stories already on the website. There are some incredible ‘tails’, it’s really worth a visit for all animal lovers. Each month 10 winners will be randomly selected. They receive a shopping voucher worth R3, 000 (for Woolworths or Takealot) and can nominate their favourite registered animal NPO/charity to receive R3,000 of Hill’s pet food. That’s R30, 000 of Hill’s food being given away each month, from now until end December.